This module discusses climate change, particularly as it is currently being affected by increasing concentrations of greenhouse gases emitted by human activities. It also covers signs of climate change, how scientists study climate, the current thinking on future changes, and what can be done to minimize the effects. Updated in 2012. Lot of graphics. Good production value. Out of date. Needs to be updated to include 2018 findings. Needs to provide a more unbiased perspective by presenting more data and views of people with different opinions. this one was hard but good overall. It is a great way to learn about climate change. These types of activities are so vital for the current and next generation of youth worldwide. very informative and step by step videos . This lesson is really dull and takes a long time. The information is very clear and concise though. Overall, thought it was a good introductory lesson to a variety of climate change topics. It was too long and by the time you got to the quiz it was hard to remember some questions answers. I'm a visual learner, so not having the option of looking at the written version was difficult for me. This lesson is great for newcomers to climate change and as a refresher for those with knowledge on the topic. A little history lesson was insightful and the layout with the short videos was helpful and entertaining. It was long, poorly structured, and boring. The lesson was very useful and informative, however, I would have loved to learn more on the climate change mitigation and adaptation strategies or plans. Furthermore, I was also expecting the session to capacitate us on how the local government can integrate the climate issues into their sector plans(eg. IDP, SDF, EMF, IWMP etc). Found the module interesting enough and some info was definitely new to me. The lesson was informative but questions were tricky. this is an alternative learning platform. It is almost like being in the classroom instead of reading a textbook on your own. The lesson is designed in a format that is very easy to follow and the content is just right. This was a very interesting module, and I learned a lot on climate change. Also, the innovative way of presenting was excellent. Lab is educational, however found the quiz challenging as there were not many practice questions throughout. A good overview of climate science for beginners. This lesson is helpful when clearing misconceptions and allowing viewers to better understand what is happening in the world, but the information is a couple years out dated and could serve to be updated, and without prior knowledge some of the more scientific concepts might be confusing to new people. So much information to try to take notes and absorb. I thoroughly enjoyed this lesson. This lesson is long but rewarding. I thought the lessons well organized, offered in bite-sized pieces, and appropriate to my prior level (low) of knowledge, yet never "dumbed down." I liked the "what do you think" chances to test my comprehension. The information was good. the quiz questions were not. The quiz questions seem like they were laid out by someone who knows the correct answers to the questions, and not buy someone who has actually taken the quiz. This makes the quiz much more difficult then it would normally have been. I think some of the problems on this quiz, aswell as the Quiz 1 were unclear and confusing. Its hard to know what i got wrong because although it showed me that i got a wrong answer, it wouldn't help me find the right one. I don't like how you can't go back and read and or look at the graphs for the questions. it was hard trying to understand the information, then translate it to the questions in the quiz, i feel as if i needed words to see so i could read them instead of hearing, this is just my way of learning which is through reading and understanding what is being displayed. It is very detailed for the basic student. Help others understand how to get to this point to take the quiz, because I took numerous ones and labs. My lab is still not counted for. Very informative. Easy to navigate. The lesson is great. There is a ton of information and trying to apply everything from the lesson during the quiz was a bit stressfull. This was a great deal of information, but it is all relevant. I like that the course works for many levels of student (my eight year olds were looking over my shoulder here and there and getting something out of it), but I didn't feel like I was missing information where I wanted to dig deeper. My only recommendation is updating with newer information, when possible. this is all educational, and on the job training for me. This lesson, despite being over an incredibly vital topic, was incredibly boring to listen to. The material was presented very blandly. I recommend taking this to the person who wants to gain insight into the area with being weighed down by TMI. Although I cannot say that this course is stellar on an educational level, I would encourage others to struggle through it simply so you can provide valuable feedback on course content and the delivery system because God knows, the latter needs improvement! Module conducted through videos with no text for digestion. Video speaker is poor presenter of information. What should be learned is not emphasized for audience. The module is poorly organized in sense of teaching information. Exam quiz questions are too open (All of the above or none of the above); not representing what should be learned critically about climate change. 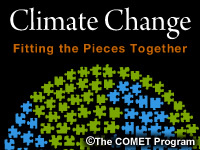 Good objective information related to climate change puzzle. I like that the module introduces the uncertainties in our understanding of climate change. I like the short videos because they provide time for reflection between ideas. This module is very informative and the images makes it so easy for learner to understand. One can see the great amount of effort to create this module. However, as the scope of this module is too huge, it would be good to split the module into different parts and let the learners decide the part that is suitable for the learners. The monotone speaker makes this a tough module to get through. The videos are short making clicking on the videos, every two to three minutes, an inconvenient, and redundant task. List factors that influence climate on Earth. Identify greenhouse gases and their sources and define their role in climate. Identify the countries that contribute the most to greenhouse gas emissions. Identify ways in which climate and climate change are studied. Describe similarities and differences between weather and climate models. Explain how the current rate of climate change compares with past episodes of climate change. List various pieces of evidence for current climate change. Describe evidence for human involvement in current climate change. List anticipated effects of future climate change, and determine which are considered most likely. Winter 2012: This version contains updated temperature graphs and information about climate change and extreme weather, sea level rise, and regional impacts.